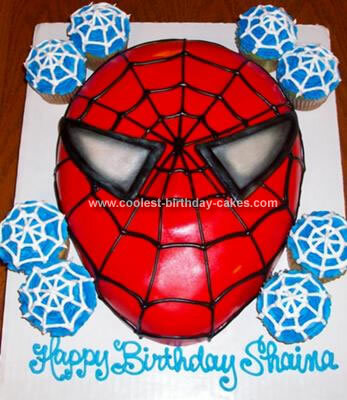 This Spiderman Birthday Cake was made for a friend of mine who had a daughter turning five. I baked a square cake then carved the shape of the face. I made a small wedge from the excess cake for the nose. I then covered the cake in a thin layer of buttercream and homemade marshmallow fondant. This was my first attempt at fondant and it was surprisingly easy. I airbrushed the face red. I then used a toothpick to mark the lines for the webbed face. I used black royal icing for the webbing. Royal icing colors easily and worked better than buttercream would for this. For the eyes, I cut a paper pattern first to be sure they were both the right shape and size. The eyes were made of fondant that I sprayed black with the airbrush. After the eyes were dry I brushed them with a little silver luster. Cupcakes are topped with blue buttercream and royal icing webs. Great Job! This is my favorite out all the pics! Hi that is a magnificent job, can you tell me what exactly you used for the black webb on his face.. i attempted this cake and it came out ok but i used wilton colour black and it was too runny…it looked a bit messy as a result.